Do You Need to Re-Evaluate Your Advisor Relationship Now That the Fiduciary Rule Is Dead? The Department of Labor (DOL) fiduciary rule, also known as the conflict of interest rule, was vacated on June 21, 2018 by the Fifth Circuit Court of Appeals, effectively killing it. Financial blogger, Michael Kitces, called this, “A dark day for consumers and real financial advisors.” But why did we need this rule, don’t all advisors act in your best interest? If you think so, you are not alone. A survey from Business Wire indicated that 53% of clients thought all advisors were fiduciaries, and therefore act in your best interest. However, not all financial advisors are fiduciaries, and that becomes a problem for clients. This DOL rule was born out of necessity, after years of financial advisors and institutions selling expensive and complex products to the detriment of the client. Initially, the DOL was intended to be broad-based, but after financial firms spent millions lobbying Washington, the rule was reduced to mainly protecting client’s retirement accounts. Specifically, the DOL prevented advisors from moving a retirement account (e.g. 401k, IRA, etc.) into a “brokerage account” unless the advisor obtained a BIC (best interest contract) exemption. Meaning, the advisor could not open a brokerage account unless they could prove this was in the client’s best interest. To me, that was perfectly reasonable. So, what was all the fuss about? With the DOL rule in place, some financial firms had to re-invent themselves to show they were acting in the client’s best interest and discontinue some of their revenue driving practices that may not be in the customer’s best interest. Brokerage accounts were one of the main victims to this rule. These accounts were the foundation to some of the largest advisor networks, Edward Jones comes to mind (only an opinion). In brokerage accounts, advisors may be paid commissions when they buy or sell new securities. The compensation varies depending on the type of product being sold. This creates a lucid incentive for advisors to recommend securities that benefit the advisor. The products that pay the most to the advisor are often the products that would harm the client. Not sure what that means? Think of products like annuities, life insurance, structured notes, and other products you may not fully understand. Furthermore, with many securities, advisors (or brokers) get paid on a per transaction basis. Many have ever heard of, or had a relationship, with an advisor that bought and sold securities excessively. Were you perplexed by this activity? If that advisor had you in a brokerage account, the reason is simple, they make money on each transaction. So, it would make sense to create a rule requiring advisors to act in the client’s best interest, especially since this should be their job in the first place. The DOL rule made an effort to define “fiduciary.” To keep this simple, a fiduciary is someone that is legally bound to act in your best interest and places your interests above their own, and those of the firm. This is nothing new to Registered Investment Advisers, regulated by the SEC, as they have been held to a fiduciary standard for decades. The issue is with financial advisors acting as Brokers (or salespersons). Brokers are regulated by the Financial Industry Regulatory Authority, or Finra, the securities industry’s self-regulatory body. They must provide what the agency describes as “suitable” investment advice. This falls short of the fiduciary care required of their adviser counterparts. Are clients the victims of cognitive dissonance? In a survey by Cerulli Associates, almost 75% of clients think their advisor must act in their best interest. However, according to Financial Engines, only 50% of clients are sure their advisor is a fiduciary. 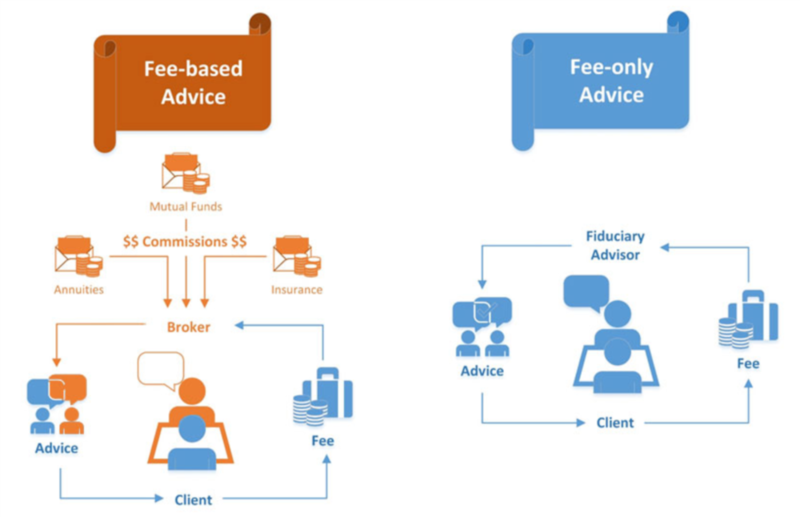 If your advisor is not a fiduciary, they most likely do not have to act in your best interest. Shocking, I know. Why would an advisor misrepresent if they were a fiduciary? According to a survey from Business Wire, if clients found out their advisor was not a fiduciary, only 12% of them would continue to work with their advisor in the same capacity. Advisors that are not fiduciaries often set up accounts where they could have several revenue streams from transactions, investment companies, commissions, and a percentage of your assets. This would make it difficult for them to clearly disclose what they are charging their clients, and a reason the compliance department at their broker/dealer won’t let them attempt to make these disclosers. 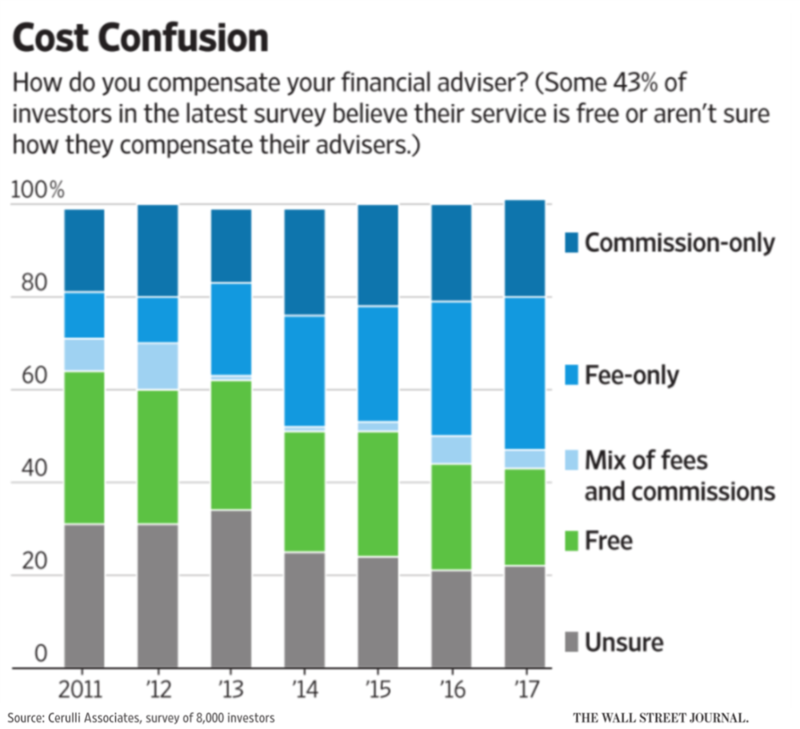 This may be the reason why a significant amount of clients do not know what they are paying their advisor. According to a survey from Cerulli Associates, 43% of clients think their advisor is either free or they are unsure how that advisor is being paid. I have worked with other advisors that have sold annuities over managed account to strengthen their retirement position, instead of the clients. In many annuities, the advisor is compensated up to 8% up-front, plus 0%-2% per year on an ongoing basis. The advisor may weigh that payout against charging as a percentage of your assets where they may only receive 1% less transaction costs, less other fees. Below, you will see an example of the advisor payouts from a popular annuity contract. In Option B below, if the client is under 80, the advisor receives 5.95% up-front, 1.00% in years 4-7 and 1.30% thereafter. If you have been sold an annuity, did your advisor properly disclose this conflict of interest to you? The client was scared about the market so I gave them what they wanted. The client liked the idea of tax-deferred growth. They wanted an annuity so I provided it to them. The issue - the advisor did not take the time to educate the clients, or possibly disclose the conflicts of interest (in writing), because they are incentivized to keep the client in the dark. I don’t think these advisors are bad people. Only that they want to believe these contracts are beneficial to the point where they seek information showing annuities are beneficial so they can sleep at night. Meanwhile, they shun any information about the negative consequences of annuities. In addition, the broker/dealers these advisors work at filter and disseminate positive information about annuities in order to drive profit at the firm. I’ve seen it! Relationships with a broker/dealer, or bank, has been known to create issues for clients when their advisors are engaged in sales contests, pressured to sell proprietary products, or incentivized to cross-sell to other areas of the firm. Below, you will see a few examples of the conflicts of interest that may exist in one large bank. Do you think the clients got to pages 56, 56, and 74 to see these conflicts? If they had, would it change their decision to work with that firm to pursue their financial goals? If you are interested, you can read the full document here. They are fee-based or do they receive compensation in addition to what you are paying them? For example, in an annuity, you do not pay the advisor directly, but the annuity company provides ample payment to the advisor. Mutual fund companies may provide advisors additional compensation for placing the client in a more expensive share class (I’ve witnessed that as well). Are they legally bound to act as a fiduciary? If they say yes, ask them to put it in writing. If you hear, “My broker/deal requires us to do what is right.” I would laugh and walk out the door. Certain credentials like CFP® have a code requiring a fiduciary relationship. However, this may not be adequate with your savings because you may not have legal recourse. Due to the inherent conflicts of working for a broker/dealer, it would be nearly impossible to truly act as a fiduciary and disclose all possible conflicts of interest. If your advisor will not put their fiduciary relationship with you in writing, I would encourage you to find someone that will. This should be a red flag and I would not gamble with your life’s savings. Our firm, Noble Wealth Partners, is a Registered Investment Adviser and will always act as a fiduciary to you. We will always act in your best interest and we will disclose any material conflicts of interest that would impact our recommendations. And yes, we will put that in writing. Click here, if you want to see our fiduciary statement to you. Or visit our website at https://nwpplan.com/fiduciary-statement/ to find out more. Noble Wealth Partners, is also a fee-only advisory practice. We do not receive compensation on insurance products, annuities, mutual funds, transactions in your account, bonuses from our broker/dealer, or commissions for selling specific securities. This means, the only compensation we receive is our fee charged directly to the client. We put forth our best efforts to make sure our clients understand what they are paying, and what they are receiving for their fee. In fact, try to find another financial advisor’s website where they publicly display what they charge their clients. Having trouble? At Noble Wealth Partners, we stress the importance of transparency in our fee structure. We publicly display our fees on our website so clients never have to second guess what they are paying. We help individuals and families prudently manage their investments, and pursue their financial goals. For a different approach, call us today and see how we can help you. It's a College Planning Buffet! On FIRE for Early Retirement!